Incredible places to get married in all 50 states, Washington, D.C. and Puerto Rico. Choosing the right place for a ceremony and reception is more than half the battle when you’re getting married. The good news is that there are plenty of beautiful wedding locations across the country. So, whether you’re looking for something that feels modern and hip, or rustic and romantic, here are some amazing venues from coast to coast that will truly take your wedding day to the next level. This mom-daughter run, veteran-owned venue spans 23 acres and features two ceremony sites. Their barn reception location combines rustic and refined décor and has both heat and AC — allowing you to dance the night away in comfort no matter what time of year it is. Perfect for an intimate destination wedding, Second Star Mansion sits on 2.5 acres of oceanfront property with private beach access to Kachemak Bay. The 17,000 square foot home sleeps 30 and guests have a gorgeous view of Alaskan sea life from the deck. Guests can also arrange for amenities like a personal chef, a masseuse, bear excursions, helicopter rides, deep-sea fishing expeditions and more. If you love color, The Saguaro Scottsdale might be the perfect venue for you. With the ability to host up to 500 people, this indoor-outdoor space has everything you need, including expansive bar spaces, three fireplaces and a fire pit. This 210 acre botanical garden rests on the shores of beautiful Lake Hamilton and features a chapel with a vaulted glass ceiling. Recognized as one of the top botanical gardens in the U.S., Garvan Woodland Gardans encourages visitors to explore it’s bridges, waterfalls, seasonal flowers and cascades. With the ability to accommodate 250 guests for a seated dinner and up to 450 guests for standing cocktail parties, The Fig House is beautifully decorated but can present a unique point of view based on your event. HGTV star Emily Henderson helped to design and curate the space; it’s a contemporary spin on art-deco with its stained glass windows, bold colors and outdoor gardens. It’s all about the breathtaking backdrops and small touches at any wedding or special event at Devil’s Thumb Ranch. Work with their team to choose the right ceremony site and create a dinner menu full of fresh, local options. Straight out of a Fitzgerald novel, this turn of the century estate is bordered by 100 acres of woodlands and can seat 200 people for dinner. The historic Wadsworth Mansion style is representative of the gilded age, full of beautiful details and plenty of glamour. You can also bring in your own vendors to completely customize your experience. An in-demand venue since 1913, the Hotel du Pont features amazing Gilded Age charm like glittering chandeliers, pillars and parquet floors. With two event rooms — the Gold Ballroom and the Du Barry Room – the hotel is a refined backdrop for your special event and can accommodate large functions of up to 500 guests. Known as the Pink Palace, The Don CeSar is a Gulf Coast legend. With versatile indoor, outdoor and beachfront venues for your wedding ceremony, all of their spaces feel effortless and luxurious. With plenty of room to stay, your closest friends and family can join the ranks of famous past guests like F. Scott Fitzgerald, Al Capone and Franklin D. Roosevelt. As one of the most unique wedding venues in Atlanta, The Estate is welcoming from the very start with its southern-style double doors and fountain garden. The event team makes any occasion easy because their catering, design and floral teams are all handled in-house, making the process seamless. While there are plenty of rooms for guests to enjoy on the big day, one of the coolest is the old wine cellar downstairs. A historic 2,700-acre property located on the north shore of Oahu, this estate has amenities like its famous polo grounds, a premier equestrian center and the largest coconut tree grove in Hawaii. Visitors can enjoy horseback riding, surfing, hiking and parasailing while experiencing local culture and history. With a combination of rustic elegance and natural beauty, Shore Lodge is set right on the edge of Payette Lake. With a little something for everyone — waterfront or mountain views — you can choose your wedding themes to fit your style. Offering delicious food, wine, guest accommodations and an amazing space, there’s plenty of ways for you and your guests to unwind both before and after the ceremony. A quintessential Chicago loft space, this venue features a ton of natural light, exposed brick, 20 foot tall, warm oak timber ceilings with exposed bow trusses, industrial piping and beautiful copper-gloss concrete floors. For your wedding they’re also willing to customize the space and lighting to create the perfect ambiance. An old historical home built in 1916, Laurel Hall’s rich history, beauty and character can create an idyllic backdrop for your wedding. With indoor and outdoor event spaces set on six acres, it offers plenty of versatility too. Don’t be fooled by its pre-war vibes, the space has been updated with modern amenities. Consider this venue a blank slate for your own wants and needs on your wedding day. With beautiful outdoor spaces and an elegant interior that can accommodate up to 250 guests, the team will work with the best vendors to ensure that the day goes smoothly from coordination to clean-up. This beautifully restored barn is a little less than 3,500 square feet and features a generous seating capacity of 230. Its large doors open out to a lovely meadow that you can use as a ceremony location. The property also has bride and groom cabins, making getting ready especially easy. Sitting on 200 acres of wooded land, there’s more than enough room to make all of your wedding dreams come true. Magic and romance may have no finer ally than the Southern Oaks Plantation. Set in picturesque New Orleans, the venue is known for its delicious cuisine, exceptional service and charming southern sensibility. The venue’s elite team of wedding professionals will work with you to provide an unrivaled and unforgettable experience. Nothing says New England quite like The Nonantum Resort in historic, Kennebunkport, Maine. This award-winning venue offers breathtaking views of the state’s rocky coastline, while their exceptional food and beverage services will only enhance your reception. It’s such a special place that they frequently get couples who come back year after year to celebrate their wedding anniversary. The George Peabody Library will astound any book lover. Ranked as one of the most beautiful libraries in the world, there’s no prettier place for your own love story to be celebrated. One of its most stunning features is a massive skylight soaring over six tiers of cast-iron balconies, each of which contains over 300,000 volumes dating from the Renaissance through the 19th Century. The Boston Public Library is one of the most unique and historic event venues in the city, offering plenty of beautiful spaces and backdrops that accommodate a variety of party sizes. Small and intimate, or large and grand, you can choose whatever space you like. Their courtyard has a beautiful fountain while the interior of the library is lovely with its arched ceiling. The birthplace of the Ford Model T car, the Ford Piquette Avenue Plant is recognized as one of the most significant automotive heritage sites in the world. Now it’s an amazing industrial-style venue. With exposed beams and brick, it’s a beautiful backdrop for your ceremony and reception. Guests will love looking at the classic cars around the property too. This gorgeous 1940s barn provides a romantic gathering place for your special day with over 10,000 square feet of indoor event space. Run by a husband-and-wife team committed to making your experience one of a kind, this unique venue puts the natural beauty and landscape of Minnesota on full display. ccommodate up to 350 guests in the stunning ballroom at Oak Crest Mansion. With its immaculate millwork, antiques throughout the home, sparkling chandeliers, marble floors and a mahogany bar, there are so many details to appreciate. You and your guests will enjoy the romantic ambiance and southern hospitality of this property. With two different areas within the 28 Event Space, The Kansas City Room & The Station both feature top-notch amenities, modern décor and impeccable service. The Station is ideal for smaller, more intimate gatherings while The Kansas City Room is a 7,500 square foot warehouse that was remodeled to combine a vintage vibe with a cool, modern feel. Nature lovers will appreciate this dream wedding locations. With a little bit of everything, the Montana Wildflower Weddings venue has lush green meadows, flower gardens, water features and mountain views to set the stage for your wedding ceremony. They also have a rustic barn that can host your wedding or reception and their capable team will help customize it to your own personal style. As one of the first post and beam barns in Lancaster County, this space once served as storage for horses and hay. Now, the weathered barn walls and hand-carved Amish doors add touches of charm to the 3,700 square feet of event space. Chandeliers, vintage lanterns and cafe lights add a touch of magic and brighten the room. It also has modern restrooms, a replaced wood floor, campfire pits and a view overlooking Salt Creek. Inspired and non-traditional, weddings on The Las Vegas Strip can be truly unique. With a dedicated team catering to every aspect of your special day, you can customize your experience at The Cosmopolitan — fulfilling an intimate ceremony or a massive reception. Their wedding experts can also design a unique luxury experience, from arranging transportation to planning fun activities like mixology lessons, spa treatments and VIP table service at The Chandelier. Situated on the shores of scenic Portsmouth, Wentworth by the Sea offers spectacular ocean views and comfortable accommodations. Set up celebrations for up to 250 guests. You’ll love their all-inclusive packages! With plenty of delicious food and lots to do locally, guests will love exploring the surrounding town. Their guest rooms and spa services aren’t to be missed either! Use their East or West Houses separately or together – either way, you’re going to have one spectacular event. The West House has French mansard style fireplaces and chandeliers accented with Venetian glass. Meanwhile, the East House has 24-foot high ceilings, intimate settings and a graceful staircase that leads to a private suite. With more than a standard menu, they have the finest chefs that serve a complete and sumptuous menu from cocktail hour through dessert. Hotel Albuquerque's outdoor pavilion and garden setting for wedding ceremonies and receptions can suit guest lists ranging from 10 to 300 people. With its landscaped event space full of fountains, rose arbors, lawn courts, Spanish-style gardens and a Victorian-style pavilion, you’ve got plenty of options when picking where to celebrate. For an extra hand, work with the hotel’s wedding planners to further customize the day. 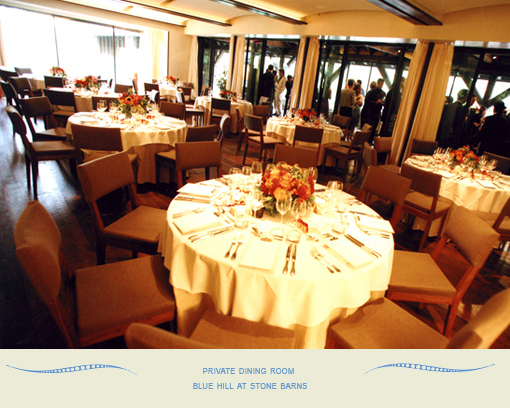 Blue Hill at Stone Barns might be one of the best event spaces in the country for food lovers thanks to their creative menu and farm-to-table ethos. With private dining for up to 14 guests and their HayLoft, which holds up to 260 guests, you can do something small or large in this space. With over 15,000 square feet, they can accommodate ceremonies too. Work with their event team to fully customize your wedding day. Looking for an elegant venue to host your wedding? This beautiful home, one of the largest in the country, sits on a hill and is set against the stunning Blue Ridge Mountains. The grounds, full of terraces, gardens, courtyards and stables provide ample indoor and outdoor settings for your event. You and your guests can enjoy activities like spa treatments, wine tastings and private carriage rides. Think of the Red Barn & Berry Farm as a blank slate where you can make your wedding dreams comes true. The team here helps with set up, behind-the-scenes and cleanup so you can fully enjoy your day. The traditional red barn and surrounding grounds feel rustic and elegant, and even feature fire pits for guests to enjoy as your event heads into the evening hours. The new Oak Grove venue lets you dance underneath the stars without worrying about weather! The Lord and Burnham historical greenhouse offers a magical open-air experience, while The Cottage and Main Hall isn’t far away and has all the modern luxuries you might need. In between, a patio and courtyard offer picture perfect backdrops like towering oak trees and Grace Pond. At Southwind Hills your outdoor ceremony option is tucked away in a beautiful forest full of red bud and cedar trees. 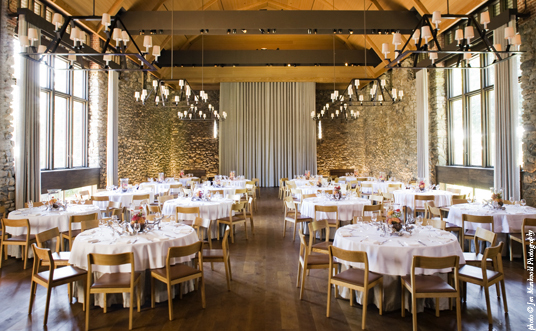 The space, with its exposed wood and rustic charm, is complete with a 400-foot wooden walkway, handcrafted pews, romantic bistro lights, elegant chandeliers, a large customizable arbor and a stage that accommodates up to 400 guests. The Tin Roof Barn is nestled within the rolling hills, apple orchards and green pastures of the Columbia River. The barn is over 100 years-old and has a true turn of the century authenticity, and charm that can be seen in its exposed beams and unique slatted walls. With plenty of light and a versatility that will appeal to a variety of looks and styles, you’ll have fun putting your own personal touch on this space. The Phipps Conservatory and Botanical Gardens is not only a beautiful venue – it’s green too! Exchange vows in their Victorian glasshouse or throw a large reception in their Outdoor Garden. The structure looks as delicate as lace against the vivid green plant and floral background. The team will work with you to bring your grandest visions to life all in one location. While you might need to do a little more legwork to get married here, history buffs won’t mind getting the permits necessary to tie-the-knot at these two forts in Old San Juan. An ideal backdrop for exchanging vows, the forts overlook San Juan Bay, Castillo San Felipe del Morro and Castillo San Cristóbal and were built to protect the city from enemy attacks. Nothing says Rhode Island like this historic venue that features its own lighthouse and vast green lawns that look out onto the ocean. There are plenty of spots to exchange vows on their 40-acres, and then enjoy dining and dancing underneath a custom sailcloth tent. This historic mansion has sweeping ballrooms, lush private grounds and open-air piazzas. With 18th-century charm and modern amenities, guests will enjoy taking in the estate and grounds with museum-caliber artwork and antiques, and a 200-year-old magnolia tree. The Blue Haven Barn can seat up to 300 guests in their main room and the venue works hard to make the process as easy as possible for you. With details like a vaulted ceiling, stained wood tables, chiavari chairs and a grand staircase, it easily adapts to fit a variety of themes and styles. Take the party outside on their patio where you can dance underneath the twinkling lanterns and string lights. This venue offers picture perfect views and is the largest space – 9,000 square feet – on the property. With an exceptional balcony, stage and walk-up bar, the reception area can accommodate up to 350 guests. Don’t worry if you’ve already chosen a caterer, they allow you to work with any caterer and/or licensed and insured bartender that you’d like. Sitting between Onion Creek and Jackson Creek, The Greenhouse offers a unique setting for events by placing guests in the midst of nature. Family owned for three generations, the property has a variety of lush, native plants, century-old oaks and natural open spaces for you and your guests to enjoy. With a focus on conservation and sustainability, they’ve utilized rainwater collection as their primary water since the 1970’s and promote rooftop solar panels. Perfect for an intimate wedding, this historic landmark in Park City might be the chicest place for an occasion. With plenty of intentional interior design details and touches for guests, they’ve updated the property to include a terraced pool and spa, and the interior of the hotel feels like the coolest, curated collection of art and design elements. The staff will bring the same level of detail to your special day. Vermont is gorgeous year-round, so choose from several indoor or outdoor ceremony sites on this 700-acre property. The greens of spring and summer, the vibrant fall foliage, or the bright white of winter all offer amazing backdrops while the view stays breathtaking all the time. Work with their talented wedding coordinators to figure out all of the logistics for the day. Nestled in a valley surrounded by the Blue Ridge Mountains, the Keswick Vineyards seems like it’s straight out of a dream. Ideal for your wedding ceremony, cocktail hour and reception, the venue’s hand-stitched Aurora tent is the prettiest spot for guests to gather, rain or shine. Talk about a fairytale! When you choose to have your wedding at TreeHouse Point, they give you exclusive access to their entire four-acre forest for up to 22 hours. Full of towering trees, lush greenery and breathtaking tree houses, their wedding packages include overnight lodging for up to 18 people. While Anderson House feels like a historic estate, it’s nestled right into the heart of D.C., near Dupont Circle. Filled with unbelievable architectural details and plenty of history, consider having your cocktail hour out by the courtyard pool. It’s the perfect place to snap pictures of the happy couple too. If you’re looking for a unique location that blends indoor and outdoor spaces, this venue is just right for you. With over 50–acres of fields and forests, a rustic barn and cliff views, the spacious clubhouse and reception tent allow you to experience all their surroundings have to offer. Olbrich Botanical Gardens’ 16 acres set a beautiful stage for your ceremony and reception. The best part is that you don’t really need to choose between an indoor or outdoor setting. Thanks to the atrium, it still feels like you’re outside without having to worry about rain on your big day. With details like bridges and fountains, there are more than enough spots for the perfect photo op. The Grand Targhee Resort allows you to take your wedding to new heights with a truly unique experience. Couples can customize their day on the most scenic location in the Tetons. With delicious food, a day-of-event coordinator, a complimentary wedding night stay for the couple and lift tickets to the top of the mountain for a stunning photo op — the Grand Targhee is perfect.